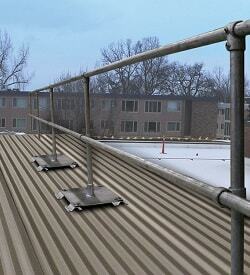 This railing system is OSHA compliant and attaches to metal roofs with Mounting Plates. 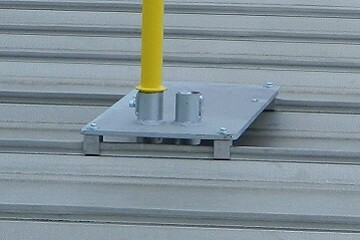 Standing seam roofs use Mounting Plates with non-penetrating clamps. Exposed fastener seam roofs use Mounting Plates with penetrating connectors. Integrated options are Toeboards and Self-Closing Safety Gates. Standard finish is hot dipped galvanized. 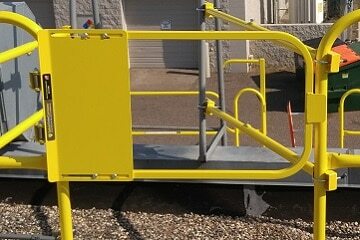 Rail Sections can also have an optional safety yellow powder coat finish. This system is for metal roofs that can structurally support the System and 200 lb. force load as required by OSHA. Please consult with an engineer to determine if your roof will structurally support this system. Rail Sections attach to standing seams using Mounting Plates with non-penetrating clamps. This system is easy to install with plant site workers using just a few hand tools. 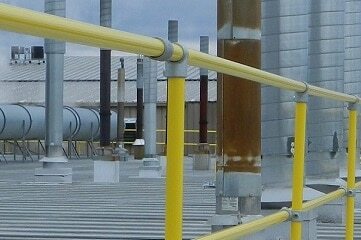 Precise Fit Rail Sections are used for Metal Roof Railing System and provide a continuous, clean design. Top rails, mid rails, and stanchions are trimmed at the jobsite for an exact fit.